Local authorities have agreed to investigate concerns that gas produced as a result of energy development may be contaminating ground and surface water in the West Divide Creek area on Colorado's Western Slope. If the concerns prove valid, the Garfield County Commission could ask the state to reimpose a drilling moratorium in the area, which was the site of a natural gas seep in 2004. The county acted last week in response to resident Lisa Bracken's concerns that renewed drilling by EnCana Oil & Gas (USA) has contaminated groundwater that is leaking to the surface at her property. EnCana and the Colorado Oil and Gas Conservation Commission staff say they have not found evidence to support Bracken's assertions. 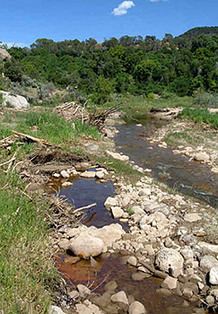 New evidence of mine seepage into Colorado's Divide Creek watershed has regulators and environmental groups calling for a reinstatement of moratorium on oil and gas activities in the Garfield County area on the Western Slope. Photo courtesy of Lisa Bracken. Despite the lack of evidence, Garfield County Commissioner John Martin said the county decided to honor her request for another investigation. "We will see one more time," he said. The commissioners have asked the county to hire University of Wyoming geologist Geoffrey Thyne to investigate Bracken's concerns. Thyne's review of a county hydrogeological study last year found that increased drilling is causing more gas to show up in domestic water wells in the Divide Creek area. Thyne contends that the gas is linked to the drilling activity. "The conclusion I came to is that there seems to be increasing methane in the groundwater and it seems to be coming from produced gas," he said. The oil and gas commission imposed a drilling moratorium in the Divide Creek area after gas and benzene from an EnCana well surfaced in the creek in 2004. The seep resulted in a $371,200 fine against EnCana and new drilling rules in the area to try to better protect water. The commission later lifted the drilling moratorium, but Bracken wants it reinstated in some areas where seepage concerns remain until the outstanding questions are addressed. Bracken said she started seeing evidence last year that natural gas is leaking from wells, including a blue film on surface water, crawfish mortalities and dead or dying vegetation. But the commission's tests on Bracken's property did not find evidence of such a leak. Groundwater sampling in the area has uncovered evidence of gas, but there is contention over whether it is from biological sources or not. EnCana spokesman Doug Hock noted that repeated tests by the COGCC and an independent lab have failed to show evidence of groundwater contamination. "In both cases, there's been no evidence found that drilling activity is impacting groundwater," he said. Bracken said she is confident that Thyne's investigation will support her claims. "It's going to be a battle of the experts," she said. "Dr. Thyne is outgunned, but the good thing is he's got science on his side. They've got everything else on their side -- money, officials. We'll just see where it goes." Thyne said he expects to complete his review by May.